I found the perfect leggings and you can't get me out of them! I bought these front leather panel leggings from Ted Baker and I have worn them every weekend so far. Even though it has been warm, these are still comfy and perfect for fall. This time that I wore these pants, I met up with a close friend for brunch in Soho and paired these pants with an over-sized sweater from one of my favorite local boutiques in Astoria, Hanger. I just bought these maroon booties from JustFab and the cutout makes them standout from all other booties I am used to seeing. The color is even nicer in person than what I expected when I purchased them online. This outfit was casual enough for brunch but also fun and perfect for catching up with a good friend. 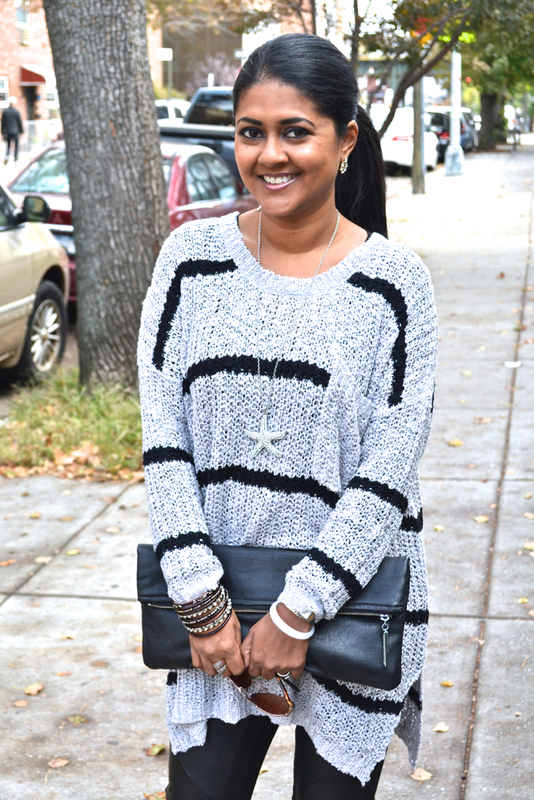 I kept my accessories simple with this black clutch and my starfish from Amrita Singh. Remember this from last month, well it will be on heavy rotation all through fall. Also, I wore these leggings again recently for a birthday party and I just changed up the top, switching to an all black sweater and faux fur vest. I plan to find many more ways to style these pants!